A few months after Kings Island opened in 1972, "The Partridge Family" cast came to film their ABC show there a full year ahead of "The Brady Bunch." The episode called "I Left My Heart in Cincinnati," with Johnny Bench as a waiter, premiered on this date, Jan. 26, 1973. Bench took time from his 1972 National League MVP season to shoot a cameo as a poolside waiter – wearing a black bow tie and gold jacket – at the old Kings Island Inn just north of the park. 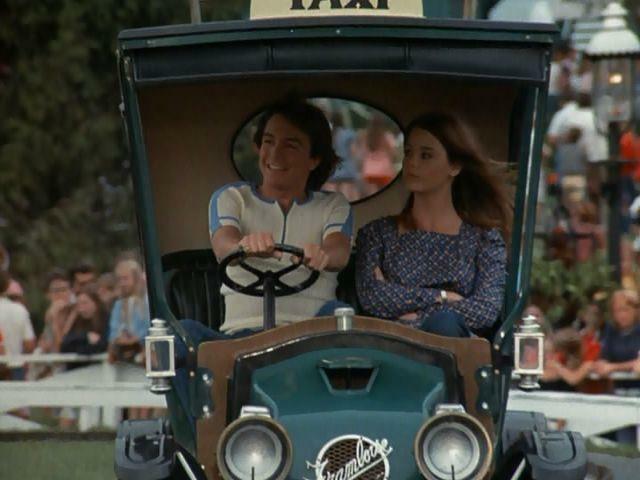 David Cassidy and Susan Dey riding the antique cars at Kings Island in 1972. The TV family of pop musicians -- stars Shirley Jones, David Cassidy, Susan Dey, Danny Bonaduce, Suzanne Crough and Brian Forster – were shown enjoying the park when not performing on an International Street stage. The episode title refers to teen heartthrob Keith (Cassidy), his little brother Danny (Bonaduce) and their manager Reuben Kincaid (Dave Madden) all trying to date Kings Island publicist Audrey Parson (guest star Mary Ann Mobley). It's a fun time capsule from KI's first year, with scenes of the long-gone sky ride, the Kings Island Inn rooms and pool, and young female park employees wearing funky yellow-and-orange caped uniforms in this 2-1/2 minute clip for "Together We're Better." The Partridge cast rides the blue Racer, merry-go-round, Monster (Octopus), antique cars and the Rivertown log flume ride. The kids also eat in the Festhaus and dance on International Street with the Banana Splits characters. Bench's screen time lasted only 30 seconds, taking vodka on the rocks orders from Rueben and Audrey. "Make mine a vodka on the rocks too," Cassidy says. When the adults glare at him, he changes his mind: "On second thought, make mine rocks. Hold the vodka." Later in the summer of 1973, "The Brady Bunch" stars Florence Henderson, Barry Williams, Maureen McCormick, Eve Plumb, Susan Olsen, Christopher Knight and Robert Reed shot an episode at Kings Island. It was broadcast Nov. 23, 1973. After a horrible 1-8 season in 1960, the Reds traded hometown favorite "Hamilton" Joe Nuxhall to the Kansas City Athletics on this date, Jan. 25, in 1961. After his historic debut as a 15-year-old in 1944, Nuxhall returned to the Reds in 1952 at age 23. He won 83 games for in the club in the 1950s – going 12-5 in 1954 and 17-12 in 1955. He led the National League with 5 shutouts in 1955, and made the All-Star teams in 1955 and 1956. Then he fell apart in 1960 with a 1-8 record and 4.42 ERA at age 32. Even Chuckles the Clown is mourning this sad day. Actress Mary Tyler Moore – who starred in two iconic TV series, and produced many shows including “WKRP in Cincinnati” – died Wednesday at age 80. “The Brady Bunch” kids raced around Kings Island looking for lost architectural plans on ABC Television on this date in TV Kiese history, Nov. 23, 1973. Here’s the story of a show called “Brady”… Stars Barry Williams, Maureen McCormick, Eve Plumb, Susan Olsen, Mike Lookinland, Christopher Knight, Florence Henderson, Ann B. Davis and Robert Reed were shown looking all over Kings Island for Mike Brady’s (Reed) architectural drawings for the park’s expansion.